A natural dog photo session lasting approximately an hour and a half. Capture the true character of your dog and preserve moments you would otherwise miss. Select a location in the Bristol area, or opt for a session at home. The session includes a set of watermarked digital photos, yours to keep. Framed prints, canvases and photo books are available as optional extras. Andrew is a full-time professional photographer and dog owner with more than 20 years experience. This short video shows what you can expect during an outdoor dog photo shoot. Playful puppies, active adults, sleepy seniors… I love letting dogs be dogs. I’ve taken thousands of photos of my own dogs over the years, and the ones that remain my favourites are those where they're covered in mud or snow, carrying the world’s biggest stick, or simply curled up in their favourite spot at home. My approach is natural and informal, resulting in photographs that capture true character. Each of the locations below provides a great backdrop for for outdoor dog photography. They consist of open grassland, paths, and wooded areas. 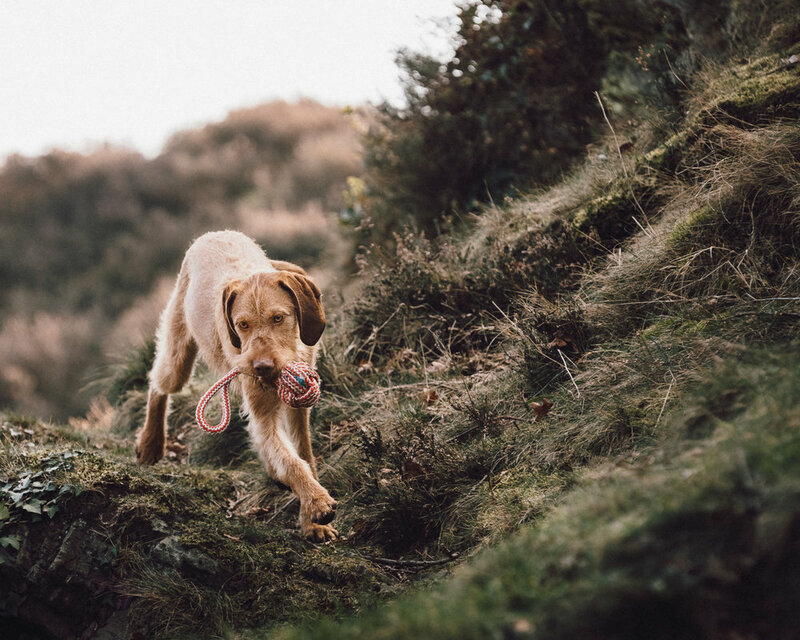 Outdoor sessions are spent capturing your dog as they explore their surroundings, play fetch, and generally have fun. 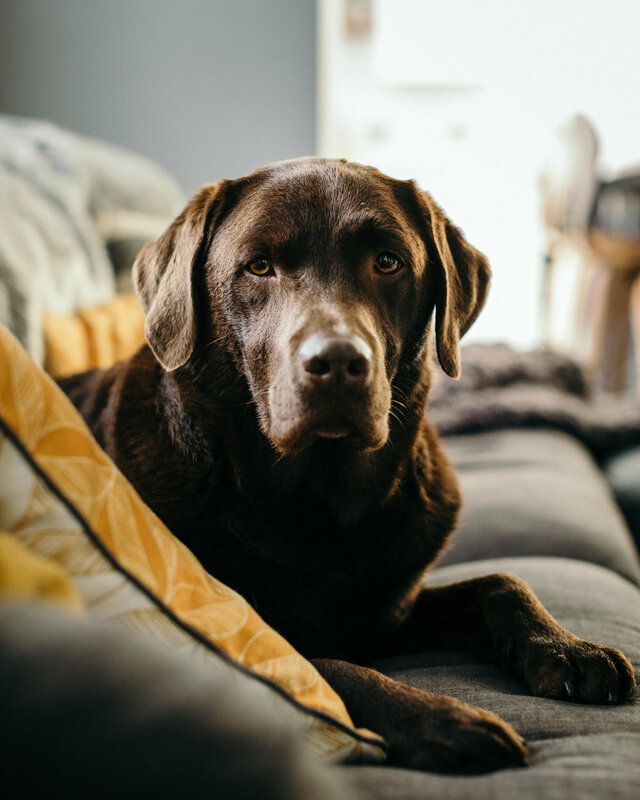 Alternatively, if you would prefer a session in your home, then this can result in great images of your dog relaxing in their most familiar environment. Open parkland and woods to the north east of Bristol, including a riverside path along the River Frome, often resulting in a very wet and muddy dog! Easily accessible from the M4 and M32. Free parking. Troopers Hill is probably my favourite location to photograph dogs. It’s a rugged, heather covered hillside in east Bristol, with rocky crags, woodland paths, and excellent views across the city. Please only choose this location if you have good control over your dog, as there are some steep, rocky areas. Ample street parking close by. An area of open grassland and woodland in South Gloucestershire, to the east of Bristol. A peaceful, rural setting, and there’s a large pond if your dog enjoys a splash! Easily accessible from Bath, the M4 and A4174. For more information about the different types of digital photo supplied, please see here. If you would like something special for your wall, or a photo book full of memories, then you can choose from the following printed display products. The book contains a combination of colour and black & white photos. Professionally printed photographs, custom mounted and finished in a high quality frame. A high quality canvas print stretched across a chunky 38mm frame. Use the form below to select a date and location for your dog photo shoot.